Water Building Resort Energy Plan. This building is called the Water Building Resort and is expected to be the first building to convert air into water using solar power. The construction has a symbolic shape of a drop of water, and the building represents an ingenious combination of nature and high-tech. The side of the building which is facing south, is covered with solar cells that will harness the energy from the sun, allowing the sunlight to pass through. The side which faces north has a special design to help in ventilation. It also includes unique equipment, which converts humid air along with condensation into clean drinking water. The Water Building Resort was designed to be built in warm and humid areas. 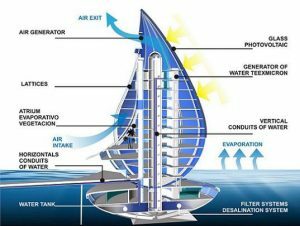 It will also offer a facility to treat salty sea water, or rain water and that will be located on the bottom floor. 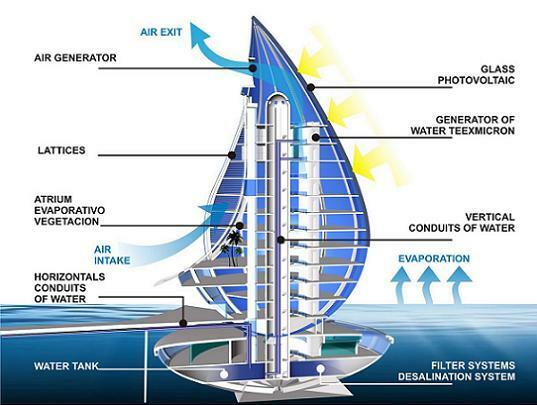 In order to monitor and certify water quality, the building will include a special center of technological analysis. The upper floors of the building will include several restaurants, gyms, conference rooms, spa services, as well as exhibition halls. All spaces will be based on theme of water, environment and renewable energy. The final touch is the wonderful underwater aquarium of the building.